Thousands in protests in Montreal and Quebec City, Nov. 29, 2014. 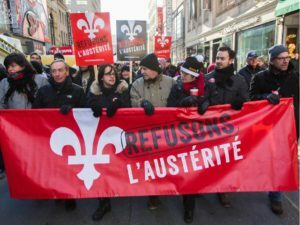 Around a thousand people protested the Quebec government’s austerity program in front of the National Assembly in Quebec City on Feb. 12, the day the parliament opened its 2015 session. The coalition, “Let’s Refuse Austerity,” is also planning major, provincewide but region-based protests on International Women’s Day, Earth Day and May 1. Back in November, the coalition had organized major protests involving tens of thousands of people in Montreal and other Quebec cities. And on Feb. 6, when Quebec Premier Philippe Couillard went to Abitibi-Témiscamingue, a small city in the western part of the province, over 200 protesters showed up in snowy, harsh cold to say that he shouldn’t cut jobs, health and other social services and education. Besides the CSN, another significant member of Let’s Refuse Austerity is the Association of Student Union Solidarity (ASSE), one of the leaders of a successful and militant student strike in 2012 that brought thousands of students into the streets for protests that lasted for months. A spokesperson for ASSE said at a press conference on Feb. 12 that the students would engage in “economic disruptions,” including blocking bridges, as they did in 2012. Camille Godbout, their spokesperson, said they would not rule out any tactic. (Huffington Post Quebec) The ASSE is also calling for actions Feb. 23-27, as well as supporting the other mobilizations. The president of the Federation of Quebec Workers (FTQ) and the president of the CSN, the two largest labor federations in Quebec, both spoke at the Feb. 12 rally. Daniel Boyer of the FTQ said the government has chosen the wrong strategy. Rather than austerity, it should look to increase revenue. “A government which is cutting employment, which is shutting down services, in our opinion, is not a government which is pushing forward this idea of relaunching economic activity,” Létourneau concluded. The fall of oil prices has caused major economic difficulties in Canada, especially in the Western provinces. Canada’s currency has slipped by 20 percent in relation to the U.S. dollar. However, while Quebec has to pay more for imports, its exports are more valuable. Quebec in many ways is a distinct society inside Canada. A majority of Quebec’s residents speak French. The immigrants it attracts are mainly from places like Haiti and North Africa, where French is a common second language. 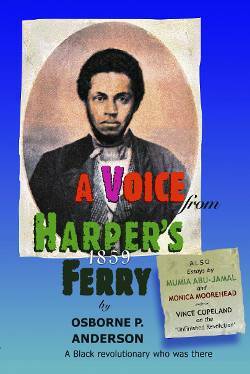 It has a historical trajectory that is unique in Canada, going from a conquered province to a recognized part of Canada. Its union movement grew up and struggled hard not just in the major cities of Montreal and Quebec, but also in the woods and in small isolated settlements, where unions provided the only protection workers had against the Catholic Church and local banks.